So i have been trying to be good and not buy too much this season (a serious case of overflowing wardrobe), however there are so many gorgeous pieces and trends on the highstreet that i couldn't resist picking up a few key pieces....so a small haul from the last month or so from ASOS, River Island, Lands' End but mainly New Look. A beautiful statement but lightweight jacket, have been layering over a silky cami top and skinny jeans. In love with all the embellished detailing on this this jacket, especially all the blush coloured tassels, makes it look much more expensive. Bought the top version of this earlier in the year (featured in Summer Stripes), but decided i needed to go back for the dress. Love the flattering shape and length, the lightweight yet structured fabric and the bold multi stripe print - not normally a red kinda girl but this just looks great against my skin tone. ASOS do the best basics at the moment, offering great classic but with a modern twist. Nothing complicated, this is just a simple swing top that is perfect for warm days teamed with jeans or shorts. I love the drop arm holes, so have been wearing a cute blush bra underneath for a flash of lace. My favourite pair from the new Canvas collection at Lands' End, love the simplistic shape of this slide style and chambray stripe on the straps gives it a very laid back casual summer vibe. I wanted a slip-on pair of sandals but something a little more stylish than traditional flip flops. Didn't have any intention of buying more shoes but couldn't resist these. Again love the tassels on the laces (can you see a theme developing here!) but also these are so comfortable with the laced up front offering extra support plus the perfect wedge height which means i can wear all day without pain...bonus! The newest addition to my summer wardrobe and another bardot piece, this top has so much lace detailing but again looks more expensive than it was. A slightly fuller style with the lace overlay but the proportions work really well with my skinny jeans. Plus really flattering as the sleeves cover up a part of my arms, that i am not a fan of but because of the lace you still get a flash of flesh. Another basic piece, more for the weekend or holidays with jeans or shorts. This simple cotton bardot top is great for hot days and would be ideal worn over a bikini. Also a bargain at less than £10. I mentioned this in my Monthly Favourites #2 - one of the best purchases this season, this bomber jacket has the perfect mix of the statement floral print with simple block colour sleeves. I have been wearing it non stop, with both jeans and my favourite casual LBD - it also made a trip to Wembley, needed to style up my football shirt to make it a little more me. 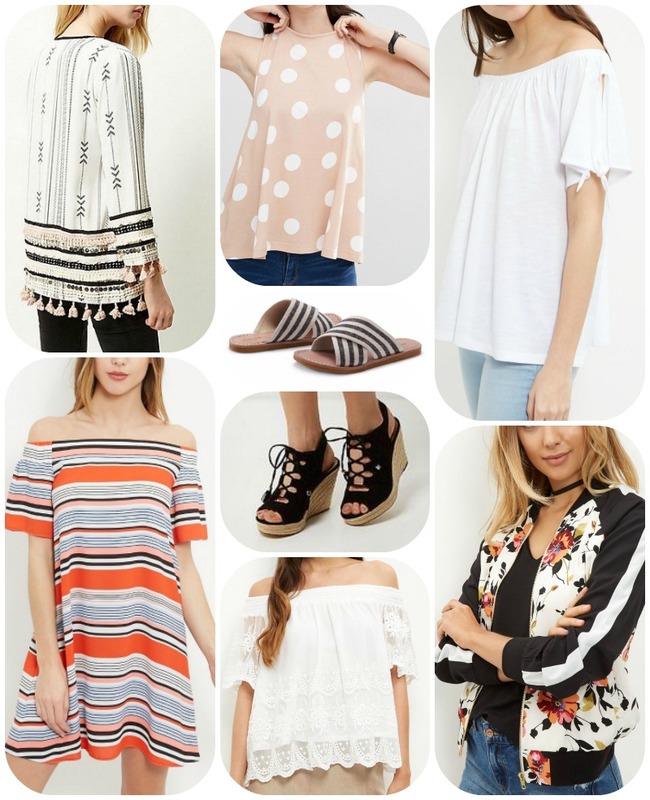 New Look in particular, is killing it this season with so many gorgeous items and prints, well worth a look especially if you are loving the whole bare shoulders or bomber jacket trend.